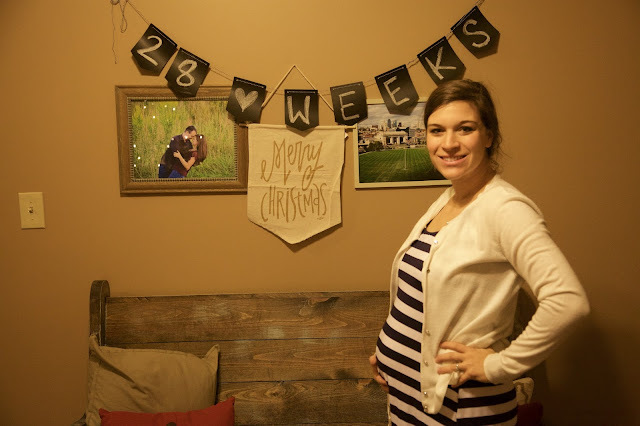 As I hung ornaments and placed fun, cozy Christmas decor around our home this holiday season, I couldn't help but think about the little helper I'll have next year. With Baby K on the way in March, there is so much joy and anticipation for all that is to come- for both Christmas and for this new little life. Now that we've been in our home for over three years, and are celebrating our fourth Christmas here, I've got a pretty good feel for my decor style and preferences. 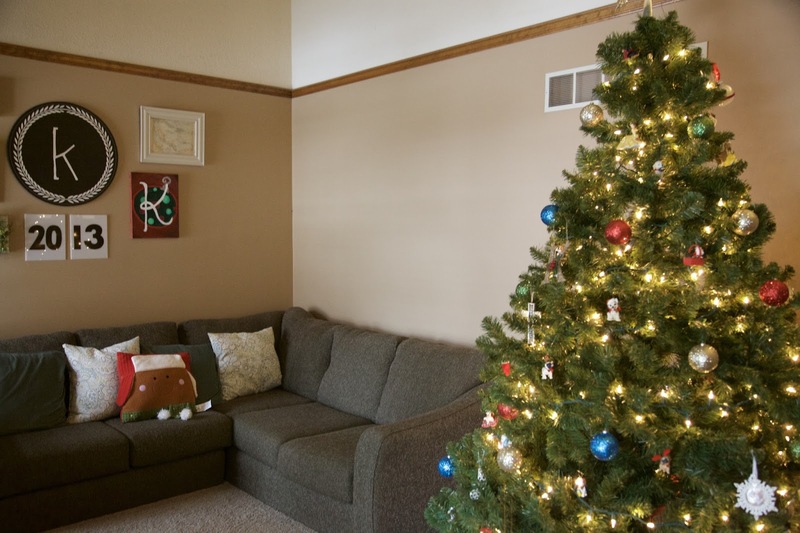 There's nothing quite like making a house a home, especially around Christmas. 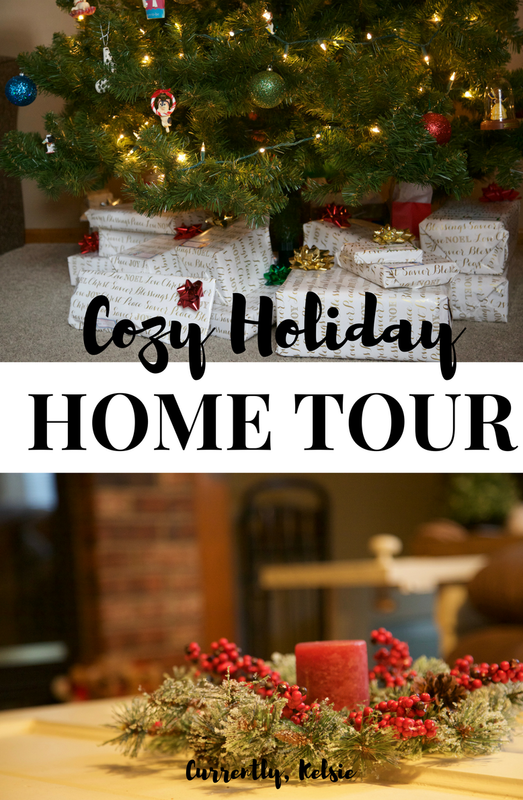 So come on in, stay awhile, and take a peek at our cozy holiday home tour for 2016! 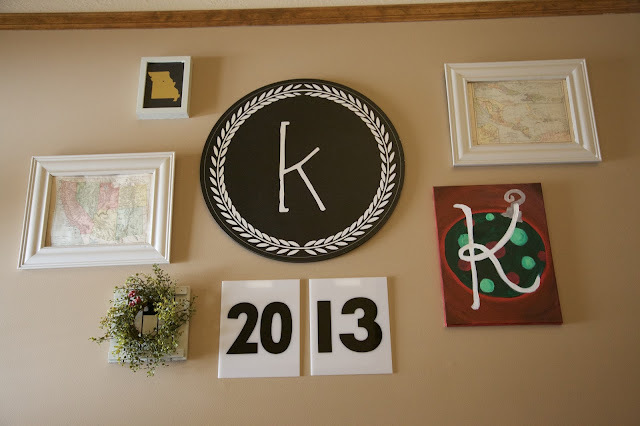 This year our front room got a little farmhouse upgrade, so it's been even more fun to decorate. 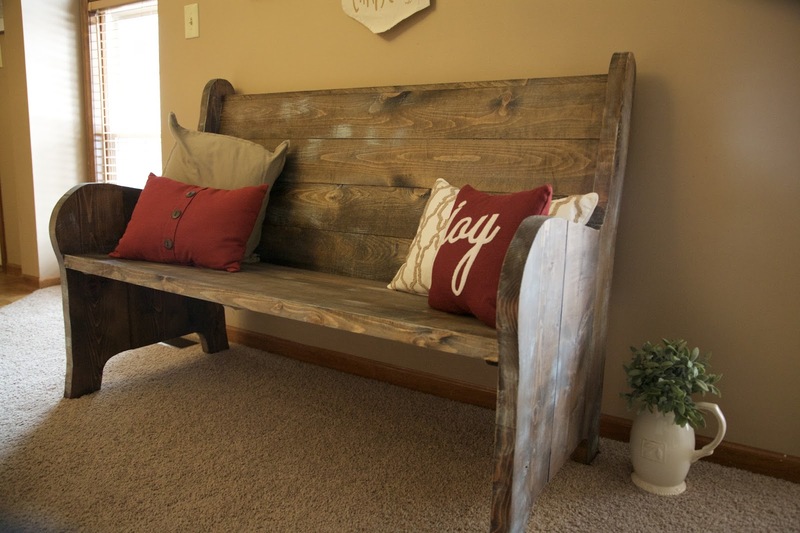 This space is the home of the tree, our beautiful new rustic pew, and an old sectional of Aaron's. 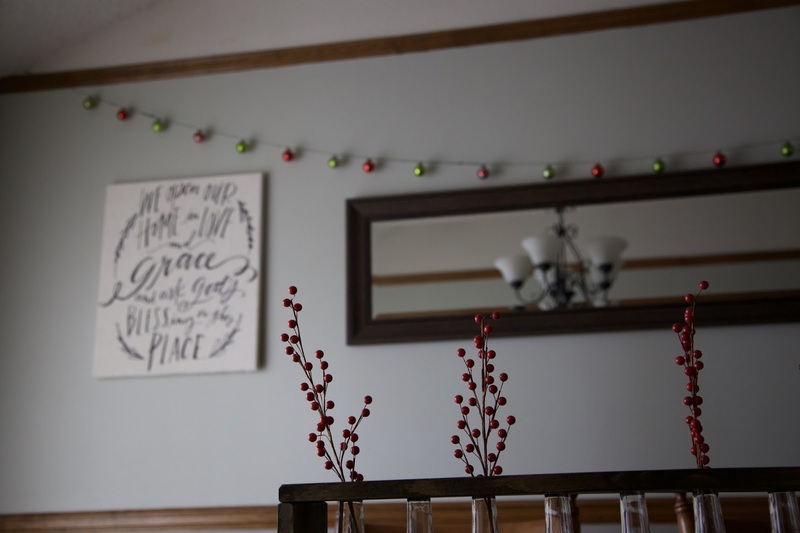 I love adding pops of red to this room through fun Christmas pillows, paintings, and berries (which are my favorite). We went with white lights and white wrapping paper this year, and I love them both. Aaron surprised me with a beautiful new burlap wreath he bought from a lady at his school. 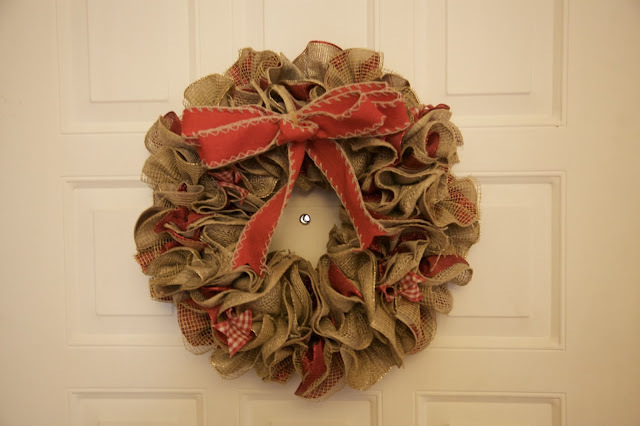 I love having a wreath on the inside of the front door, safe from the weather and adding a little cheer to the room. My only purchase this year was a $5 "Merry Christmas" banner from Hobby Lobby. It's hanging out behind our pew in a makeshift gallery wall (including my weekly pregnancy update banner). This room also got a major upgrade last January, and I'm in love with this space ever since its rustic dining room reveal. Now I love switching out the flowers in the rustic centerpiece that Aaron made me. 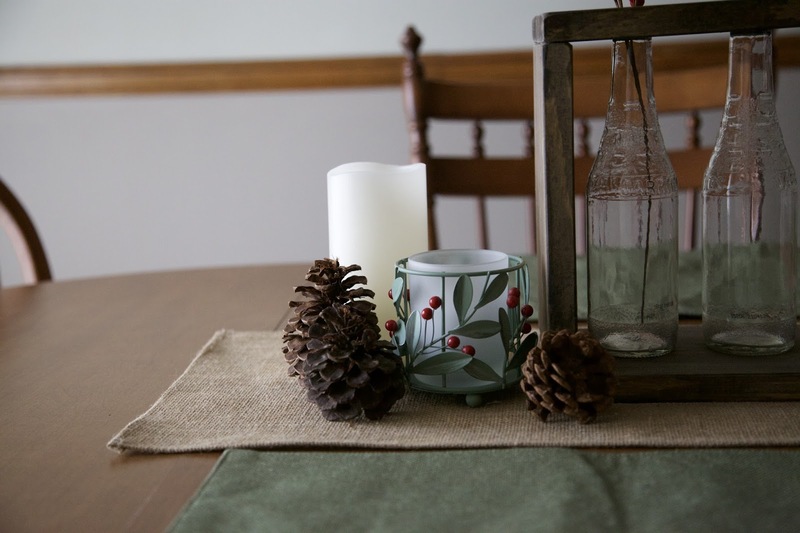 It's such an easy way to change with the seasons (and our burlap runner always stays). 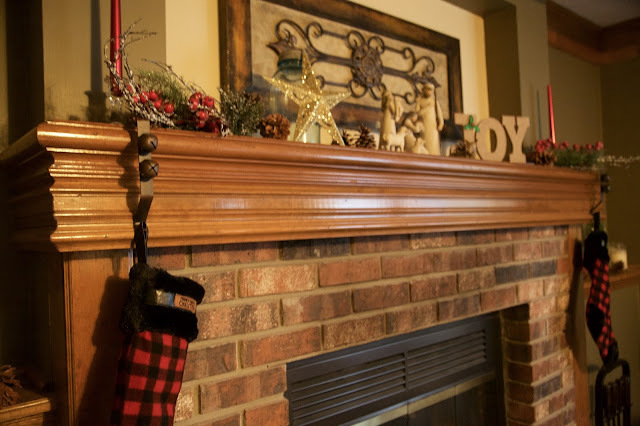 I also hang my dollar store ornament garland that I made, and then finish it off with pine cones and a few pops of red, green, and white. This is where we spend most of our time hanging out. Since we already have dark green walls, I add red and black buffalo plaid stocking and pillows, and decorate our mantle. 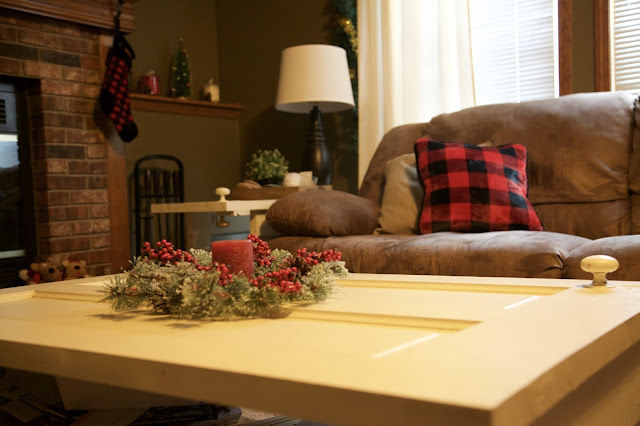 I also add a pretty wreath and red candle to give some holiday cheer to our "door" coffee table. I love the coziness of this space. All in all, I'm a big believer that home decorating doesn't have to break the bank. 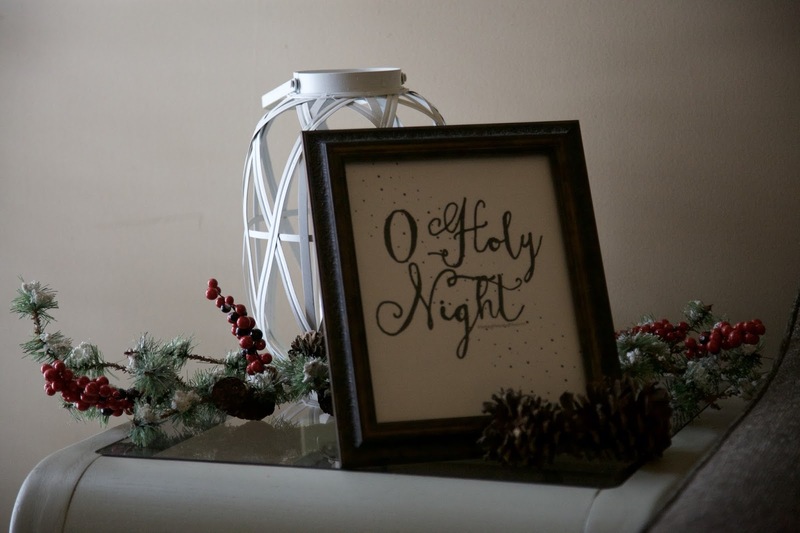 I love figuring out new ways to bring little odds and ends into our Christmas decor, and I'm finding that sometimes simplifying and keeping things cozy ends up bringing the best results. Thanks for stopping by for the 2016 tour, y'all! May your days be merry and bright! 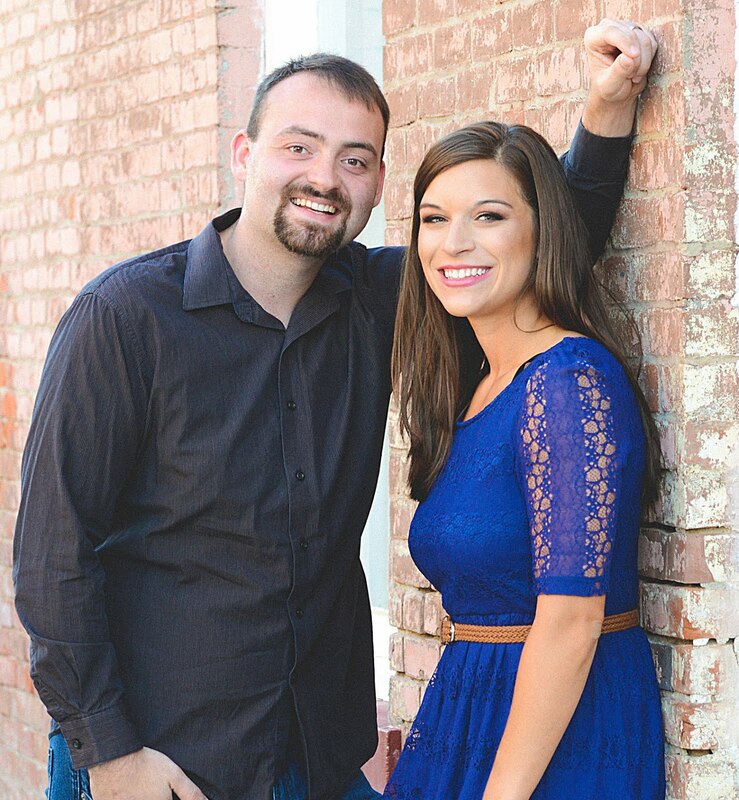 Are you following along on Instagram and Facebook? Be sure to so that you don't miss out on photos and fun updates! It's so cozy! I love your DIY ornament garland. I might have to borrow that idea! Beautiful! And you're right - so cozy! I need you to come decorate my space! Well thanks so much! I've love to look at pics and give you ideas! Your home is so cozy! I love your dining room decor! Thanks so much! It's one of my favorite rooms in the house! your home is so pretty! love your basement. Thanks, Ali! I love it down there! Well thank you so much, Aishwarya! We love it! I'm in love with buffalo check! I love it! This definitely a cozy place. Thanks so much, Amanda! 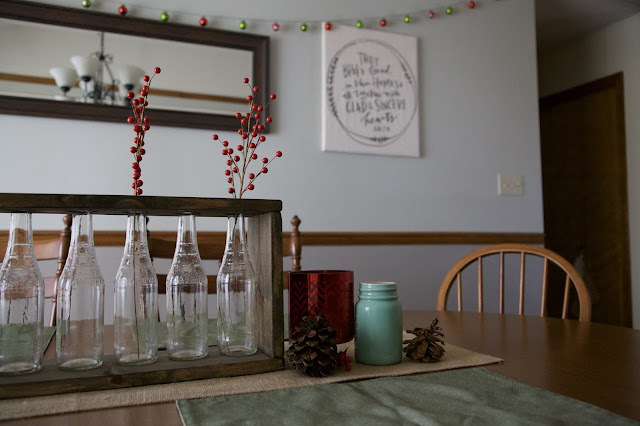 I also am a huge rustic decor fan! 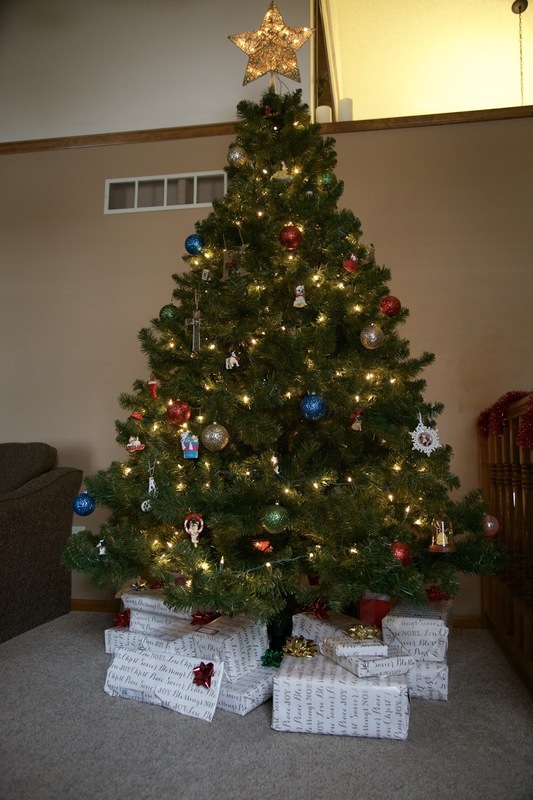 Your home looks so cozy and Christmassy. I can't wait to have a home to decorate. I second what everyone else is saying - it looks SO cozy, I love it! lovely home decor for the holidays! I love your table centerpiece, your tree looks amazing and that super cute pillow!! Thank you so much! My hubby made it and I love it! 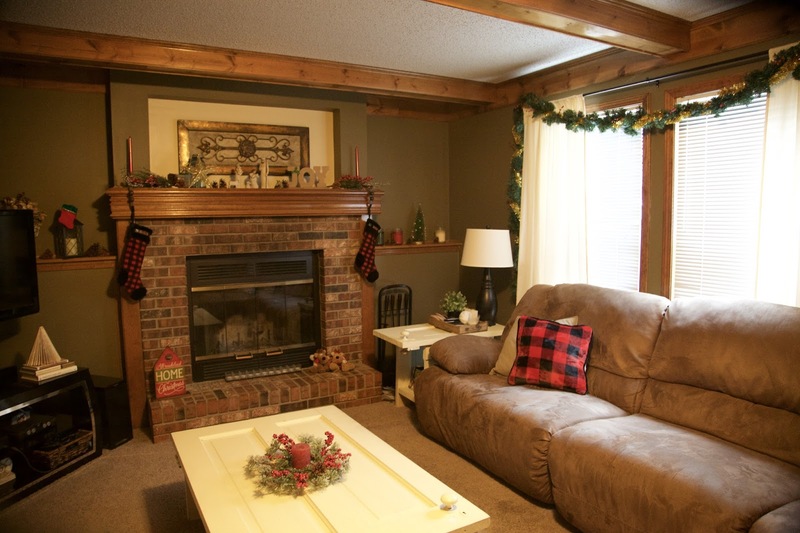 So stinkin' cozy - I lovelovelove what you did with the place, Kels! Thanks so much, friend! I loved your tour too! Thank you!! 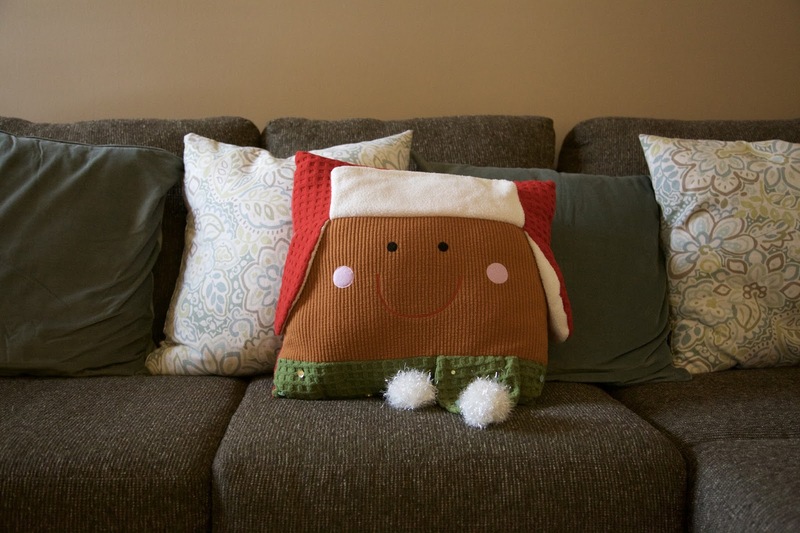 I love the pillows! I remember your tablescape from insta! Love it! And that wreath!! Everything looks great! I love the rustic centerpiece, what a wonderful way to decorate. Thanks Beth! I love how it dresses up with every season! Your house looks so great! (And so do you!) Your basement was just made for homey, cozy Christmas decor. I love it! You're too sweet! Thanks, friend! Your home is so beautiful and I love the rustic decor. I especially love that bench! Thanks so much! I love it too, and my hubby made it!